The Writing Bug: E-books: rent, buy or borrow? E-books: rent, buy or borrow? 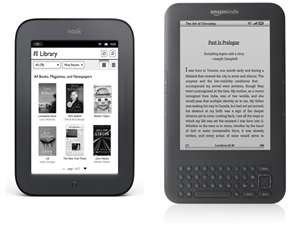 This week Amazon announced that Kindle books are now available at local libraries. You can check out digital books from the library's website and download them to your Kindle. GalleyCat also posted an article saying Amazon is considering an eBook rental service where you can pay a $79/year to rent as many eBooks as you like. It should work a lot like Netflix. I love Netflix, but I like to own my books. Still, I have many friends who love their readers and would love this. According to the article, publishers haven't bought into the model because it may "downgrade the value of the book business." So this may be more theory than reality. I confess, I still don't own a reader. I'm a hardcover snob and use a library for the other books I want to read but not necessarily own. Still, a reader is high on my Christmas wish list. I was wanting a Nook because you can share your eBooks with your friends, but the library-enabled Kindle appeals to me for all the books I want to read from the library. And if a rental service guarantees all the newest books, boo yeah, I kinda need a reader. With these two options available, would you ever buy an eBook? By having these options, does it up your desire to own a reader? How do you think these new eBook options will affect the publishing industry? Seriously, will anyone buy an eBook? Someday I think a reader will be in my future. Lots of advantages, but I'm still a cover-to-cover kind of guy. Renting though...that might be something worth checking out. I'm not sure what happens to writer royalties, but unlimtied books for $79.00/year? Could be tempting. Still, to have bought The Ledge, and then meet Jim and Kevin and have them sign it, can't do that with an E-Reader! Hi Brooke -- I received a Kindle for Christmas and have over 25 books loaded on it so far, many of them good mystery catches on the short term freebie promotions. As for using it, so far I've only used it on trips. Maybe if I ever get all the hardcovers and paperbacks I've collected read, I'll use the Kindle a lot more. I use my Kindle all the time. It's great. I take it everywhere and have read far more books in the past 6 months than in any other 6 month period in the past 76 years. Holy crap, that sounds like a long time.